♡ •.¸¸.¤* ArtLove&OtherAddictions *¤.¸¸.• ♡: All's fair in LOVE and WAR!!! All's fair in LOVE and WAR!!! And that's what I'd picture "ROMANCE" kids! Identity of Vancouver's Mysterious Smooching Couple REVEALED!!! "Proud dad Brett Jones has identified the famous kid kissing a girl while Vancouver burned, saying on his Facebook page, "This is my son. How's that for making love, not war!" ..."Here's two people lying in the middle of the street," said Lam. "We stopped, I looked back... this person was hurt and there was someone else coming to her aid." MUMBLINGS: Now THATs something you don't get to see everyday. Talk about bad timing! I mean, WOW. I felt that tingling sensation I get when I read very romantic stories. It makes you think of flowers and babies and world peace and then hum to the beat of “It's a wonderful world". Great show kids! Peacemakers all around the world would really appreciate these two's way of saying "make love not war"-wait, hold the phone- that wasn't mean literally, right? But anyways, WAY TO GO FOR ORIGINALITY! 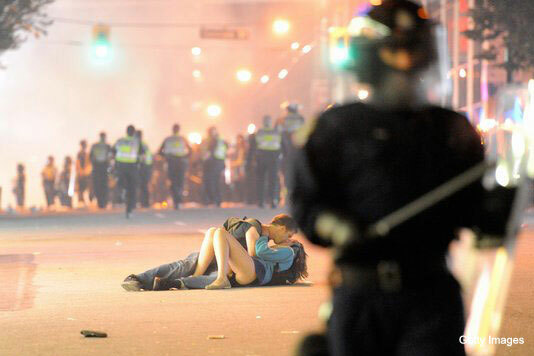 Even though it sucked that they were smooching in a middle of a riot still it's romantic! It's like a romance novel come to life! Seriously! It's every romance junkie's dream! Right? RIGHT ?! Yeah, I though so! @NIKKOLAV: hi nek! Thanks for your comment and you're right!I did find this a bit surprising and if you've been following through some of my post you'll most obviously realize that I'm an addict of romance. Well, seeing these two sets my heart a blaze and it's like a dream come true to all romance novelists and romance junkies like me. I hope you stay tuned.